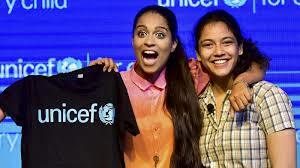 UNICEF on 15th July appointed Indian-origin Canadian YouTube star Lilly Singh as its newest Global Goodwill Ambassador at a special event here. Lilly was in the capital to support UNICEF’s Youth4Change initiative, a programme for youth that brings them together to support their peers and communities in taking action on issues such as health, hygiene, child labour and gender equality. “I’m honoured to join UNICEF as a Goodwill Ambassador and to use my voice to support its mission of reaching every child. It’s time to stand for what your kids want and not society,” Lilly said. The YouTuber, famous as ‘Superwoman’, said she would come up with few videos in Hindi and would try to put Hindi subtitles in her English videos to increase the reach of her vlogs and channel. As the UNICEF ambassador Lilly, who has 11.9 around million subscribers on the video sharing website, will use her channel to showcase the organisation’s work and urge millions of her followers to work for children’s rights.